As used in the Article: In the case of HLL Lifecare, the methods of valuation that have been mooted include discounted cash flow, asset valuation, and relative valuation. The Union Cabinet has approved the extension of the interest subvention scheme for farmers to 2017-18. The government has earmarked a sum of Rs. 20,339 crore for this. The scheme will be implemented by the National Bank for Agriculture and Rural Development (NABARD) and the Reserve Bank of India. The interest subvention scheme has been running since 2006-07, under which farmers are eligible for interest subvention of 2% for crop loans of up to Rs. 3 lakh. Subvent: support or assist by the payment of a subvention. As used in the Article: Short-term crop loans up to Rs. 3 lakh will receive a subvention of 5%, effectively reducing the rate for farmers to 4%. CCI fines Hyundai Rs. 87 cr. The Competition Commission of India (CCI) has imposed a penalty of Rs. 87 crore on Hyundai Motor India Limited (HMIL) for ‘anti-competitive conduct. Contravene: offend against the prohibition or order of (a law, treaty, or code of conduct). 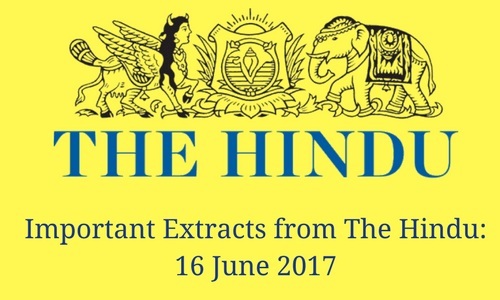 As used in the Article: HMIL was found to have contravened the provisions of the Act for mandating its dealers to use recommended lubricants/oils and penalising them for use of non-recommended lubricants and oils. State-owned oil firms IOC, BPCL and HPCL has signed an agreement to jointly set up the world’s largest refinery and petrochemical complex in Ratnagiri district of Maharashtra at a cost of $40 billion. Indian Oil Corp. (IOC) will be the lead partner with 50% stake while Hindustan Petroleum Corp. Ltd.(HPCL) and Bharat Petroleum Corp. Ltd. (BPCL) will take 25% stake each. The Centre has amended the Cenvat credit rules allowing service providers relying on natural resources like telecom spectrum to avail of all pending Cenvat credit on the day of the rollout of the GST. CENVAT: Cenvat means Central Value Added Tax. CENVAT credit is a credit in respect of central excise on inputs purchased for the manufacture or duty paid in relation to the manufacture of the final product.